Nicholas' Cub Scout Den had their "Go See It" at Kroger this month. We met up with our very friendly hostess, Ms. Denise, who took the boys all over the store. We started in the floral/balloon department. There was lots of excitement and antsy-ness in the boys. You would have thought they had never been to a grocery store before, despite the fact that I know I take my children to this very store just about every other day. Next we visited the bakery and produce sections. Ms. Denise asked the boys some questions and I was surprised that Nicholas wanted to answer because he usually gets shy in situations like this. Maybe the antsy-ness did something to his jitters. Seriously, they were all chatting up a storm and giggling and asking crazy questions of Ms. Denise. I don't know what had gotten into them but can you imagine being a customer and seeing this gaggle of busy bodys in uniforms behind Ms. Denise as she walked through the entire store. Even I thought it was cool to get to go behind the "Employees Only" sign into the store room areas. We saw pallets and pallets full of various products. Oh, is that Pepsi there? I had not noticed. 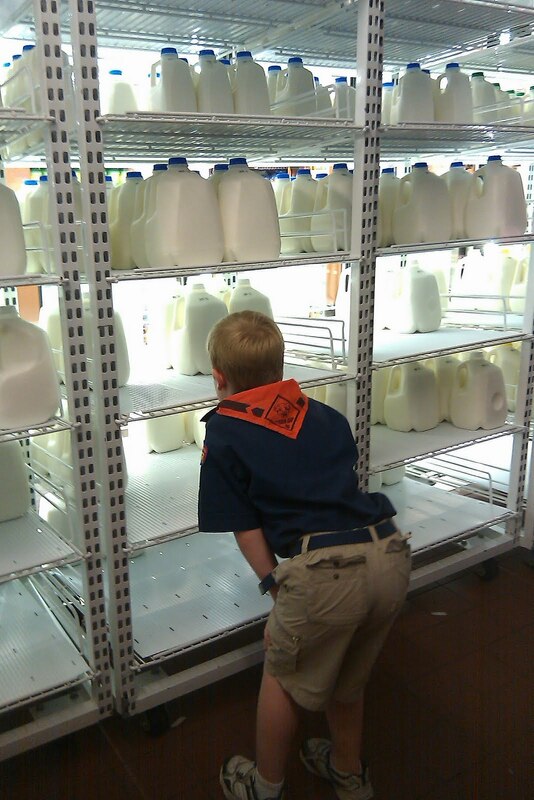 Nicholas had great fun being on the other side of the milk shelves. He has occasionally seen a hand moving around behind the row of milk jugs while we are picking out our milk. It was kind of neat to see things from the other perspective, to be on the inside looking out. The boys got to chat with the Seafood Guy for a moment. 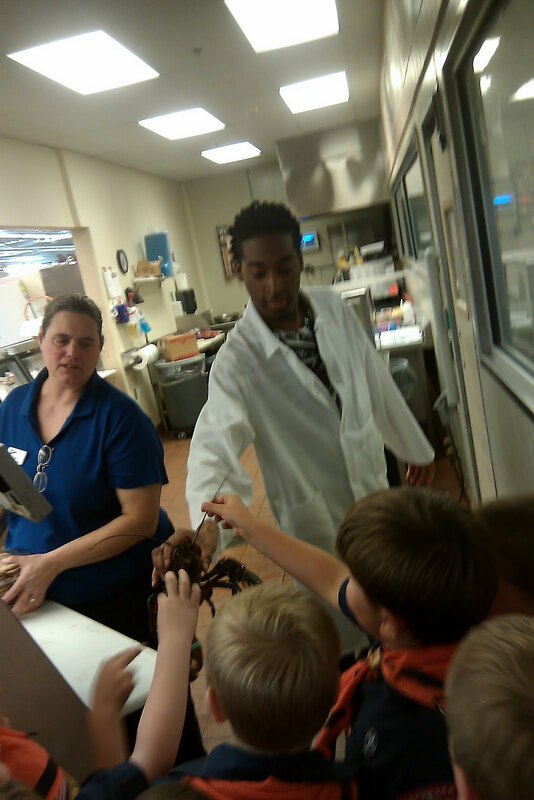 The Seafood Guy even pulled out a live lobster for the boys to touch, with banded pinchers, of course. We visited the Pharmacy where the boys got stickers and coloring books. Ms. Denise wrapped up the tour by giving the boys cookies...like they really needed the sugar rush! Thanks Kroger for welcoming our Den to tour your store. We love you and plan to visit you again tomorrow....because I just can never seem to get everything I need in one trip!